Worried about wires getting damaged or cut on-site? Transitioning to wireless data loggers like SmartRock means you'll never have to worry about lost data or accidents at the jobsite again. When deciding between wired or wireless loggers to measure the temperature and strength of your in-situ concrete, it is important to take into account the type of data you're collecting, the ease in collecting data, and on-site handling of the sensors. What Is Concrete Temperature Monitoring? One of the most important steps in the construction of a concrete structure is monitoring the temperature of your slab after placement to ensure proper curing of the in-situ concrete. This is especially true during extreme weather conditions, when mixing and curing of concrete are subject to different environmental elements. If freshly poured concrete is exposed to temperatures that are too high or too low, or if it isn't preserving enough moisture for the process of hydration to take place, your concrete's strength development will be compromised. Furthermore, this can cause thermal cracking. For this reason, closely monitoring temperature variances in your concrete slab during curing is vital to ensuring strength, quality, and durability of your structure. What Is a Wireless Concrete Temperature Sensor? SmartRock, Giatec's wireless concrete sensor, is a small wireless device used for monitoring concrete temperature and strength. Unlike traditional wired concrete data loggers, SmartRock is fully embedded in the concrete and does not require a physical connection in order to collect the data. What Is Concrete Maturity Monitoring? When we talk about concrete maturity, we're referring to the non-destructive, ASTM-certified approach to testing concrete that gives you accurate estimates of the early-age and compressive strength of in-place concrete. With SmartRock, the temperature history, along with a calibration curve of your slab is used to calculate the real-time strength of your concrete based on the maturity concept (ASTM C1074). When this information is calculated, an analysis of the temperature and strength of your concrete is updated in your SmartRock mobile application at regular 15-minute intervals. With real-time results, contractors can optimize the heating process, decrease energy costs, and save time in their project schedules by knowing precisely when they can move on to subsequent construction operations such as formwork removal or post-tensioning. Why Switch to a Wireless Device? One of the biggest advantages of SmartRock is that it is completely wireless. This means you no longer need to purchase a separate costly data logger, look for wires under blankets, or worry about damaging or cutting wires. Comparatively, wired systems require a data logger to be connected to a thermocouple in order to retrieve temperature data. Then, this data must be taken back to a lab where an expert can analyze the information to determine the strength of the in-situ concrete. In addition to high labor costs, there are several technical inefficiencies that often occur when using wired temperature and strength meters. Wires sticking out of concrete often get cut on construction jobsites. Construction workers try to keep the site clean and if they are not aware of the temperature monitoring tests, they may cut the wires for safety reasons, etc. 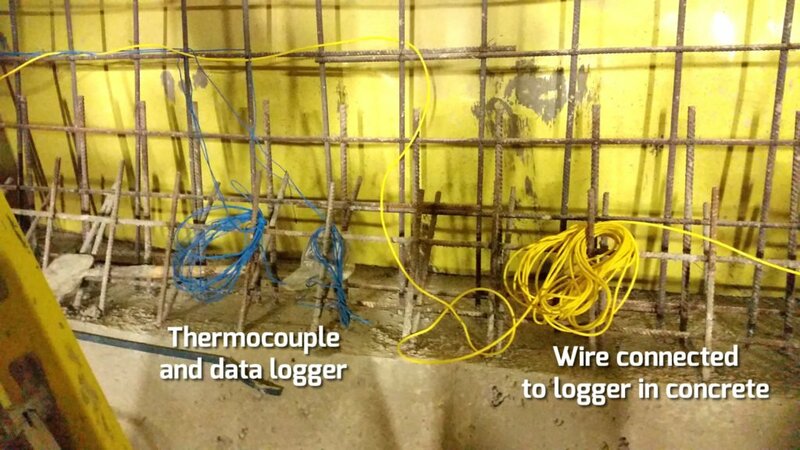 Permanent data loggers (in the case of embedded thermocouples), have to stay on the jobsite at all times. These devices can easily get damaged when exposed to humidity (e.g. rain) or can experience physical damage due to impact on-site. When monitoring temperature in various spots on their grid, workers often gather all wires in one location for ease of access. However, this can create a hassle to identify and label them properly, resulting in incorrect data collection. Moreover, the assembly of thermocouples requires attention to detail. If not conducted properly, wires can cross over in the plug and cause errors in readings. Wireless mobile-based temperature sensors and maturity meters (such as SmartRock™) are recent developments in the concrete industry. In addition to reducing labor cost associated with concrete testing, these wireless systems can significantly improve efficiency in fast-paced construction projects. *Editors Note: This post was originally published in May 2016 and has been updated for accuracy and comprehensiveness. Five Infrastructure Emergencies in the U.S.